Our trip to New Zealand starts from Auckland, one of the main cities in the North Island. We spend here just one day because we prefer to stay longer in the nature rather than in a city. The second day, we head towards Coromandel peninsula characterized by emerald-green areas in contrast with the blue of the sky and the sea. Unfortunately, we can only visit Coromandel Town because of the heavy rain that is hitting the area in these days, causing the closure of many roads for landslides or floods. We continue the trip after a couple of days in the direction of Rotorua where we spend a relaxing break at several lakes in this district. This place is characterized by a particular smell similar to one of putrid eggs caused by the strong presence of sulphur (indeed this is a well-known spa area of the country). We decide to spend the night in Taupo. Here a bizarre fifty-year-old man hosts us through Couchsurfing and entertains us all night long with his beloved reggae music and his thousands of extravagant stories. Simply amazing! The following day we stop for few hours at Tongariro National Park not far from Taupo. There are several trekkings available but the most scenic one seems to be the "Alpine crossing" of about 8 hours, during which it is possible to reach low temperatures (from -1 to -8 degrees). For this reason, we decide to start an alternative trekking from Wakapapa village and reach the small falls of Tawhai (2 hours of easy trekking). Next stop is at Wai-o-tapu, one of the places that attracted us the most. It is a still active geothermal area, able to fascinate millions of tourists for its truly surreal natural colours (http://www.marsontheroad.com/en/destinazioni/15/nuova-zelanda-paesaggi-a-confronto-tra ). We cross then several picturesque towns, completely surrounded by nature, and we meet local people always very kind and helpful; exemplary is the case of Jenny and Roger who take care of us as if their own daughters and host us in their adorable lodge in Palmerston North. Jenny even makes the dinner for us and we talk for a long time about our trips. They are a fifty-year-old backpackers couple, as good as any twenty-year-old traveller. They have a great energy and a big heart. We will be always grateful to them! We finally reach Wellington, the capital of New Zealand. It is a city that impresses us for its young soul, characterized by a harmonious mix of city life and nature. Wellington indeed offers long beaches and many colourful pubs that animate Cuba Street, one of the city's main streets. We suggest visiting the Te Papa museum, which is very interesting for both adults and children thanks to many interactive activities. Next stop, heading south, is at the glaciers Franz Josef and Fox located in the mountains of the Westland National Park. They can be reached through guided tours or individually through an easy walk of about 1 hour. Moreover, if it’s not cloudy, you can also see the snow-capped summit of the highest mountain in New Zealand, the Mount Cook of 3,724m. One of the most beautiful and fairy-tale towns of the South Island is Queenstown, characterized by typical mountain lodges overlooking the lake which make everything more magic, especially at sunset. Here we stop for few nights at Hayden's house, a local boy who lives about 10 km far from the town in a house surrounded by nature. Thanks to the absence of artificial light in that area, we can admire for the first time the Milky Way! For the more adventurous, Queenstown is also a perfect stop to experience the most extreme sports such as skydiving, swing and bungee jumping. Lovely place not to be missed and easily accessible both by private or public means of transport is Milford Sound. It is a fjord located within the Fiordland National Park on the southwest of the island and only reachable by boat; we buy a boat tour of about 2 hours for $45 NZD. After spending the night before in the nearby Te Anau, we leave the hostel at dawn in order to get on the first boat. The landscape, especially early in the morning with few tourists, is really breath-taking thanks to the atmosphere of peace and to some friends that you can meet. For instance, we luckily see a group of dolphins who swims around the boat for about ten minutes. We also meet few seals with their puppies on the rocks, at the foot of the mountains where you can even see sporadic waterfalls. The following stop is at Dunedin, an interesting city for those looking for a more intense night-life. It is indeed a university city - just 2 hours drive east of Queenstown - characterised by an octagonal central square full of pubs and nightclubs. Here we visit the local market on Saturday morning, where you can find local foods, fruit and vegetable as well as live music. Really nice! Chris is our new host here in Dunedin. He’s a student who shares the flat with other 3 guys. It is really interesting to know more about the expensive student life in this country and their future perspectives. Going up north along the east coast, we stop for few hours in the extravagant Oamaru village where it is easy to get lost in vintage shops and art exhibitions such as "Donna Demente". It is also a recommended destination to observe the blue and yellow penguin colony but you need to pay about $30 for that. So we decide to keep driving to the next village Timaru. We stop here at Aaron’s place. He is a very nice and interesting local guy who hosts us for a couple of nights. He kindly takes us to see some puppy penguin among the rocks next to the sea in the late night. A truly singular show and, above all, free of charge! The last stop is in Christchurch, a city that was probably very beautiful in the past but now unfortunately under construction due to the strong earthquake which destroyed it in 2011. We sleep at John's house, a singular 64-year-old man who prepares us a delicious salad from his vegetable garden and we spend the night playing board games with him and another Slovak girl. Here we leave our rented car at the airport and take the flight back to Sydney (if you fly with the New Zealand Airlines, do not miss the cool and innovative information video on the onboard safety rules). 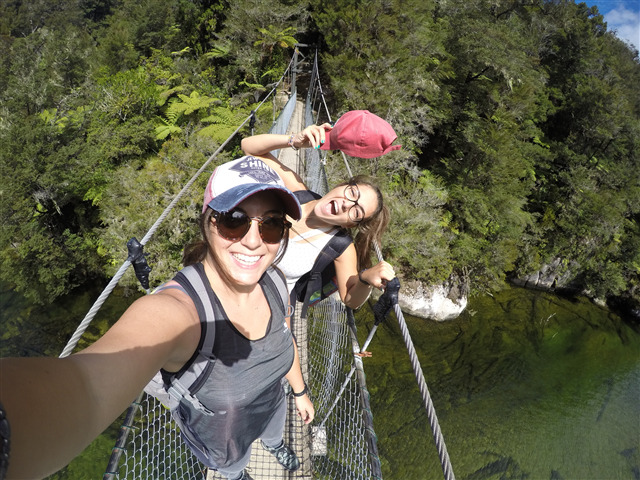 In short, New Zealand is a suitable itinerary for those who may have a couple of weeks of vacation and want to embark on an uncommon journey away from the usual holidays on the beach. Although New Zealand is an expensive country, we propose a cheaper way to visit these unique beauties in the world. Couchsurfing, for example, is one of the best options. It is perfect if you want to interact with local people without paying for accommodation and being consistent with the responsible tourism principles. Moreover, another way to save some money is travelling by car and sharing the expenses, as well as this beautiful experience, with other people. It will be not only funnier and cheaper but also more sustainable!